We’ve put together some great advice about how you can OWN the city plus this page has all the bicycle etiquette you need! It is also continuously growing as there is always more to know about this city and more things can be discovered every day – even when you have been here longer. These two-wheeled contraptions, or “fietsen” as they’re called in Dutch, are as much part of this country’s culture as cheese, windmills and tulips are (if you’re into stereotypes, that is). In fact, the Netherlands counts over 18 million bikes for a mere 17 million Nederlanders, which quite frankly is a lot. 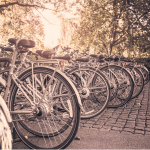 As an international student, one of your first steps should be laying claim to your first bike. Bikes are a great way of getting around and can save you a lot of money on public transport. If you are worried about safety, don’t fret: marked bike lanes are very common, and Dutch drivers are perfectly used to having bikes on the road. Bare in mind when coming to the Netherlands that bikes are a way of life and distances are often measured in ‘10 minutes by bike’ instead of walking or public transport. A few things to remember are that lights are needed at night, its probably not best to drink and drive and that this is the main way that students get around. Also be aware of the tram tracks that you might accidentally get stuck in, but as most roads have a cycle lane this is not always a problem. You may be approached late at night to buy a cheap bike from strange looking (wo)men (we’re all about equality), we recommend that you don’t continue with this transaction as they are probably stolen or broken bicycles. When buying a bike, going second hand is the smartest choice. Second hand bikes usually still ride like a charm, and their fair price makes them easily replaceable should something happen to your bike. All you need is a light that works on the front and back, as it’s a legal requirement to have bike lights on in the dark. Getting a solid second lock for your bike is also a smart move, as carelessly parked bikes are easily stolen. In Rotterdam, there are a few places where you can score (refurbished) second hand bikes for a range of budgets. Tip: We advise that you look around for a second hand one because bicycles are sometimes stolen or can break, so you don’t want to have to replace an expensive bicycle. Commodity Market Rotterdam on Facebook – This site is a treasure of second hand items and is probably the best place to pick up a second hand bike as they are sold from student to student and will not break the bank (Best place to start your search!). Brand new bicycles are expensive and are often not worth the money especially if you’re just cycling to and from university or cycling home after a night out unless you’re training for the Tour de France which by the way ran through Rotterdam in July 2015. You’ve probably heard about the Dutch weather and that we don’t enjoy the warmest climate, unfortunately this is true. Temperatures reach 0 degrees Celsius in the winter or even below that and it’s important to be prepared for a cold winter especially if you’re not used to the colder climate. The weather here is well known for quickly changing so when you leave the house it might be sunny, but it will probably start raining whilst you’re out so you better have an umbrella in your bag. Rotterdam is a port city and enjoys a close proximity with the sea, however that means that its seriously windy in the city; watch out for this! The Netherlands does enjoy a glorious summer, not tropical temperatures, but still enjoyable and it’s often hard to decide whether to sit outside and enjoy the sun or go to the library and study for that upcoming exam. The Central Library is located at Blaak and is extremely extensive with nearly a million books and dvd’s to offer. On the 6th floor there is an open quiet area where you can concentrate on reading your book or studying with your laptop. You can rent a meeting/private study room there for free if you have a library card. The library opens everyday except for Sunday. However, the opening hours differs from day to day. Be aware that in order to take out book, you’ll need a library card. 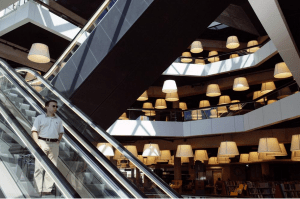 For more information about opening time and membership, please visit www.bibliotheek.rotterdam.nl. 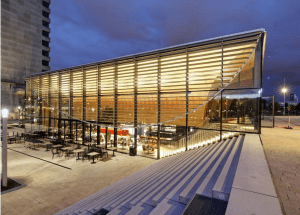 If your Educational Institution is Erasmus University then you could come and hang out at the newly erected Pavillion with its great cafe, quiet seating area and plenty of plugs. If you’re just a visitor this is also a great place for dinner, located on the Woudestein Campus. Visit their website for more information http://www.erasmuspaviljoen.nl/ . Media Markt is a major provider of electronics in Rotterdam; where you can find a wide array of adapters, speakers and even electric toothbrushes. However Media Markt is probably the last place you should look to buy something as it’s quite expensive. Also beware that if your looking for an adapter from your native country to an NL plug, you’ll have to look online as they’re not usually stocked in shops. Tip: We advise that you start by looking on the Commodity Market on Facebook because theres always a student looking to offload a printer or an old laptop. If you can’t find what you’re looking for then its best to look at independent or second hand stores. You can find a few of these stores on Meent and Jonker Franstraat, though its probably best to take a friend who knows about technology in case you get something that isn’t quite what you’re looking for. There are also a number of smaller shops in the city center where you can buy second hand electronics to suit your budget. Tip: there’s no point in buying a printer even though the cost of it might be minimal replacing the ink can be quite expensive. Educational Institutes offer an extensive range of copying and printing at a reduced rate. Rotterdam is a relatively small city, so you will almost always be able to reach your destination by bicycle. However, this can take some getting used to for internationals especially if you’re used to traffic running on the other side of the road. If you are not very confident biking the different modes of transport that are available are trains, trams, buses, metros and taxis. 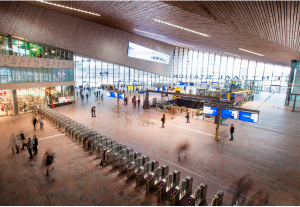 Dutch public transport is very easy to use – you will find signs and information boards with the stop names and times of departures and information booths in each station. Many of the information resources are in English, but if you’re still having problems, you can always ask the people around you – most of them will be happy to help and will speak English. Inside buses, trams, metros and trains you will often see a screen and hear an announcement for travel information, such as the direction you are traveling to and each stop you pass. It is hard to miss the right station. If you want to travel by bus, tram or metro within Rotterdam, you will be travelling with RET (Rotterdam’s transport company). If you would like to use the train either inside or outside the city, you will be traveling with the NS (Dutch Railroads). Whether inside the city or outside the city, access to all forms of public transport requires payment. The RET offers disposable tickets / chip cards for a single use that are ideal for tourists. Tip: we advise you to acquire an OV-chip card because it works out cheaper for longer stays and multiple uses. OV stands for “Openbaar Vervoer,” which is simply translated to public transport. With the OV card, you pay substantially less than if you would choose to buy a one-time-use ticket, so it is definitely worth the investment. It only costs €7.50 and it can be used across the Netherlands, making travelling easy peasy lemon squeezy. 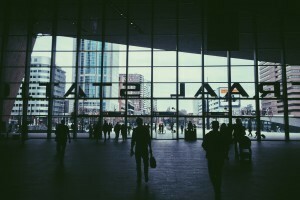 The OV card can be purchased anonymously at various selling points in the city such as Rotterdam Centraal, or you can buy a personalised card online making it possible to claim different discounts like a 40% discount on train travel. This discount is available upon a yearly payment of 50 Euros, and only applies to using the train between 9:00 and 16:00 and 18:30 – 6:30 the next morning (“off peak hours”), and on the weekend. Tip: It makes sense to get this discount if you use the train at least once or twice a month. After purchasing the OV itself for the price of 7.50 Euro, you will be able to load it with money to use for travel in different loading machines throughout the city (for example, the yellow NS ticket machines allow loading money on a personal OV, and you will find anonymous loading machines in many metro stations). The loading machines take a wide variety of payments such as visa, mastercard and coins however you cannot pay with bank notes while loading at these machines. Don’t forget to check in and check out when you enter and leave whichever means of transportation you use. When you check in €4 is automatically taken off and when you check out the correct amount is deducted, however if you do not check out the full amount of €4 will be deducted. If an inspector checks your OV and notices you have not checked in, you stand a chance of getting a fine. The train is the best way to travel outside of Rotterdam. It is safe and reliable, with accurate departure times and relatively cheap ticket prices. The first trains leave around 5:30 AM and the last ones depart around midnight. The NS does have a night network with trains leaving roughly once an hour between the bigger cities starting midnight. Currently, both the “personal” and “anonymous” OV chip cards can be activated for train use. You just need to activate it at the selling points of the OV, or at the NS yellow ticket machines, or just ask at any information point in the train station for guidance. Just like with any other types of public transport, make sure you check in and check out, otherwise you stand the chance of being fined by a conductor or automatically losing funds on your OV. When using the train, you need to have a minimum balance of €10 on your OV-Chipkaart. 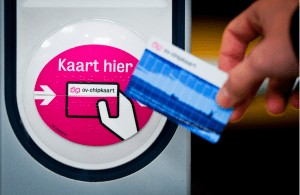 If you seldom use the train and you don’t feel like dealing with OV-Chipkaart issues, an easier option would be to purchase physical tickets which can be obtained at the ticket booth at stations. Check http://www.ns.nl for departure times, tracks, travel duration and more info. The tram-lines that pass through the city center are 4, 20, 21, 23, 24, and 25, and they all stop at Central Station. Trams 7, 21 and 24 stop close to Erasmus University and the college (HES). From Monday to Saturday most lines start at 5:00 AM and stop at 00:30 AM. On Sunday they start around 7:00 AM and retire around 00:30 AM. You can only travel by tram with OV-chip card or buy buying a paper ticket from the conductor for €3 for an hour of unlimited travel. Make sure your card is loaded before entering a tram or you will have to get a paper ticket. Rotterdam has developed an extensive network of bus routes, especially in the city center. You will rarely find yourself in a location where you have to walk more than 5 minutes to get to a bus stop. The bus is best for short travel across blocks, streets or suburban areas, and can be boarded with an OV-chip card. There is also a night bus service called the BOB-bus. The BOB concept is meant to promote safe night life, and prevent people from drinking and driving. The BOB buses runs on Thursdays, Fridays and Saturdays, travelling between popular nightlife locations and residential areas. The night bus tickets cost €5.00 for a one-way trip, if you don’t have an OV-Chipkaart. For more information visit www.bob-bus.nl. Rotterdam’s metro network is the oldest in the Benelux (Belgium, the Netherlands and Luxemburg). Old but gold because it runs smoothly, frequently and reliably. You can use your OV- Chipkaart for the metro as well. Students renting through SSH have a high chance of living right next to a station because the company strategically placed almost all of their housing options as such. Your educational institution will also be located near a metro station. Erasmus Woudestein and Rotterdam Business School are both located at Kralingse Zoom. Erasmus MC is located at Dijkzigt, Codarts is located at Central Station, Willem de Kooning is located at Blaak and Hogeschool InHolland is at Wilhelminaplein. 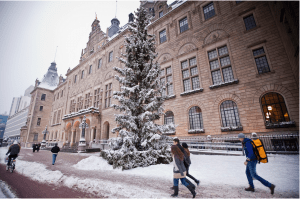 It is also possible to take Metro-line all the way to The Hague with line E.
Taxis are available 24 hours a day, seven days a week. This method of transport is most popular after a night of partying. Negotiation of prices is not possible as drivers will always use a meter. The largest taxi company is the Rotterdamse Taxi Centrale (RTC). The initial price is €2.85 and additional costs are €2.10 per kilometer. You can reserve a taxi at 010 462 60 60 and if you don’t feel like talking over the phone you can reserve one online at http://www.rtcnv.nl/ . Another unique transport option offered in Rotterdam is a water taxi. The HNY water taxis shuttle back and forth between Hotel New York, Veerhaven and Leuvehaven. No reservation is required and the waiting time is usually no longer than 10 minutes. Each water taxi accommodates up to eight people. Prices start at € 2.90 for an adult, but depend on the number of people on board and the distance travelled. Any person holding a foreign driving licence can drive with their original licence for six months from the moment of registering in the Netherlands. EU/EEA citizens can continue driving with their licenses without any changes. However, the rest will need to switch your foreign license to a Dutch one. There are several countries that have an agreement with the Netherlands allowing their citizens to simply exchange their driving license with a Dutch one for a fee of about €80. These countries are: Taiwan, Israel, Japan, Singapore, Andorra, South-Korea, Aruba, and the Canadian province Quebec. To make sure you are eligible to exchange your license to a Dutch one, you can call 0900 0739 (10 cents per minute) and make sure. The procedure to exchange your licence starts by requesting the process in the city hall, filling in forms (in Dutch! make sure you get help) and sending them in. This process takes about a month and a half, and you might need to prove you have at least six month of driving experience in your country of origin. If you are not from one of those countries, and you are not from the EU/EEA area, you need to pass a theory and practice exam to obtain a Dutch driving license. The authority in this issue is the CBR: http://www.cbr.nl/ . On their website you can enlist for a theory exam and a practical exam, for both you will need to use your BSN. It is important to know that for a practical exam, you will need a referral of a driving school, which means you will need to take some driving lessons. Some municipalities have restrictions on the minimal amount of lessons a person needs to take before being eligible for a practical exam referral from their driving school / teacher. For further information you can take a look at http://www.rijbewijs.nl/ and the www.rdw.nl – which are govermental sources of information with some useful English pages.